Provide comfort for the family of Diane Viera with a meaningful gesture of sympathy. Mrs. Diane Louise Lomas Viera, 65, passed away unexpectedly on Saturday, February 23, 2019 at Atrium Health-Northeast in Concord. Diane was born on December 25, 1953 in Milton, MA to the late Clifford Lomas and Stella Lomas Planck. She is survived by her husband, Harold “Harry” Viera; daughters, Christine Roberts (Jason), Jamie Viera; sister, Susan Machado (Charles); brother, David Lomas (Christy); grandchildren, Ethan Roberts, Hanna Roberts; nieces and nephews, Robert Machado (Ellen), Bethany Machado, Jessica Lomas, CJ Lomas; great-nephew, Max Machado; beloved dogs, Sammy and Scooter. 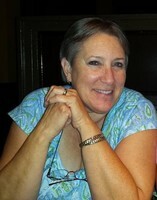 Diane was an avid reader and quilter. She loved to travel whether it be by motorcycle, plane or cruise ship, sharing her enjoyment with her family and friends. Family meant the world to Diane and she would do anything for anyone. She enjoyed making quilts for family, friends and even donating some to the Hospice House. Diane was an amazing person with a genuine smile. She will truly be missed by all who knew her. A Celebration of Life will be held Saturday, March 9, 2019 at the Northeast Cabarrus Fire Department at 1500 North Lentz Harness Shop Rd, Mount Pleasant, NC, 28124 from 1 to 4pm. Please feel free to bring a quilt Diane made for you or your favorite picture to share. Words will be spoken by a preacher at 2pm and all will be invited to share their own heartfelt words about this amazing woman that we all loved. In lieu of flowers, memorials may be made to Hospice of Cabarrus Co, 5003 Hospice Lane, Kannapolis, NC 28081. To send flowers in memory of Diane Louise Viera (Lomas), please visit our Heartfelt Sympathies Store. Provide comfort for the family of Diane Louise Viera (Lomas) by sending flowers. I am still in shock and can't believe Diane is gone. I was looking forward to doing another bike ride with her. My condolences to all the family. She is greatly missed. So very sorry for your loss. Thoughts and Prayers to the family.